A Modest Proposal. For Preventing The Children of Poor People in Ireland From Being Aburden to Their Parents or Country, and. For Making Them Beneficial to The Public. 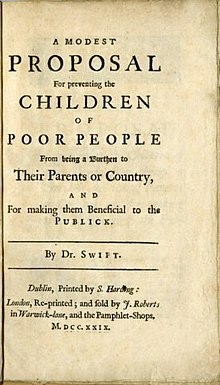 By Jonathan Swift (1729). About this text. A satire based on a satire.